©Fondation Hirondelle Participants in the training in Bangui. 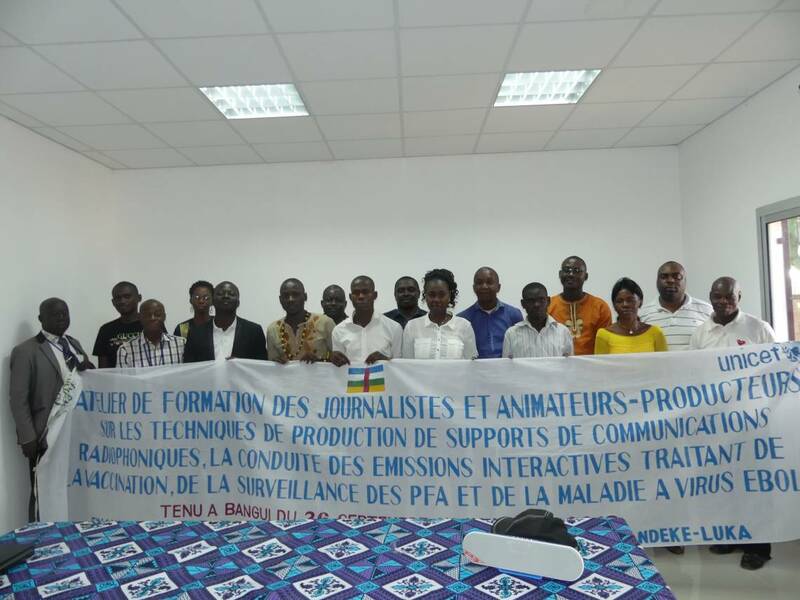 Ten reporters and community radio leaders from Central African Republic regions were trained from 26 September to 1 October in Bangui to produce prevention programs on Ebola and Polio. A partnership between UNICEF and Radio Ndeke Luka, the media created and supported by Fondation Hirondelle in CAR. This training allowed the journalists-trainers from Radio Ndeke Luka (RNL) to remind the participants of the basic principles of journalism, and to work on information gathering and processing techniques, radio production techniques (magazine, chronicle, round table, etc. ), and on the production of interactive programs. UNICEF specialists briefed journalists and community radio leaders on the main points to be addressed and the angles to use to raise awareness about the prevention of Ebola and poliomyelitis. Before the training, RNL's training journalists and Unicef specialists in polio and Ebola had worked together to design a good method of informing about the prevention of these diseases. This partnership between Radio Ndeke Luka and UNICEF has started in May 2018. A participant in the training, Jules Nankoe, head of Zoukpan radio in western CAR, said: "This training will save many lives of Central Africans. Before, we informed and sensitized without any base on these plagues! Today I feel equipped to inform and educate listeners in my region! Previously we made serious mistakes on the air in informing listeners about the prevention of these diseases. Thank you to Ndeke Luka and Unicef for providing us with the techniques, and the know-how in the prevention of Ebola and poliomyelitis through radio. "